Enjoy a generous cup of coffee, tea or hot chocolate in the new Sunday Baroque mug. The 18 ounce ceramic mug is matte black with the Sunday Baroque logo and a glossy blue interior. Orders must be in multiples of 12. 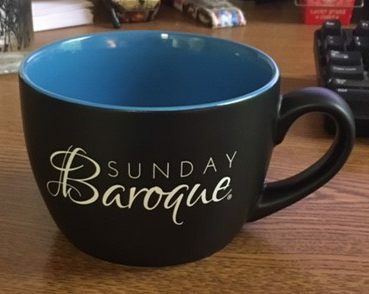 The Sunday Baroque mug is available to your station for $6 each, plus shipping. Fill out the form below to order them for your next fundraiser. Orders must be in multiples of 12. You will receive an email copy of your order.